As a kid, the end of summer always meant mom canning peaches, pickles, beets, but my favourite has always been her chili sauce. When she passed a few years back it was one of the recipes I needed to find, and, last year I started carrying on the tradition and canned my first batch. This year, with more experience and better preparation, the batch turned out wonderfully and brought me back to my childhood in the kitchen watching mom chop and can for hours on end. My favourite use for this sauce is with pork chops and breakfast sausages. Combine all ingredients in a large pot and simmer for 2 hours once it has come to a boil. I prepare my jars by washing them thoroughly and then boiling them for 5 minutes in the canning pot. I fill the jars with the sauce, pour boiling water over the lids to soften the gasket and then place them on the jars and lightly tighten the rings. I boil in the canning pot for 15 minutes and remove to cool on a towel. I re-tighten the rings once the jars have cooled overnight. I got fourteen 500ml jars from this batch, it will do twelve jars easily with some left over for sampling. 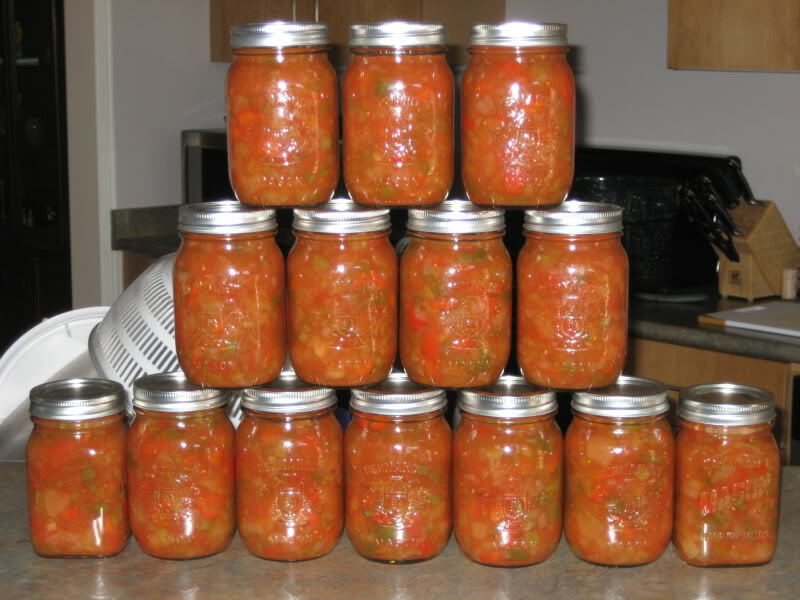 I've never tried canning before but that looks like something well worth the effort. Great job Chris. Thanks for sharing your story about your mom. You never realize how much an impact they make on your live until after they're gone. Sounds and looks mighty tasty. Thanks for the recipe. Smokey Lew, budget about 6 hours for the project. 2 hours to chop all the veggies, 2 1/2 hours to cook and 1 1/2 hours to can. It goes much easier with a few people chopping and taking on different roles in the canning process. One person boils the jars, one person fills, one person caps, one person re-boils the jars to seal. My canning rack has slots for 7 jars so 14 was the perfect fit for two batches. Yup, that's how we roll too. Do all the prep the day before, (we are lucky to have a chiller refrigeration unit with no fan to dry things out) And go crazy the next day canning every thing. Yea, we may start at 5:00 AM and go till 11:00 at night, but as Wittdog sez, the clean up is the same. Lot's of time and work, but when you go to the root cellar in the middle of winter, ya just smile and grab what ever you want. And you just can't buy that good stuff at the store!